For those of you that's been experiencing high and low in your skincare journey may have known that charcoal is not only good for detoxing internally but also good for skin. It helps binds dirts from your pore and therefore getting rid of those unholy clogged pore and balancing excess sebum. But using direct activated charcoal on your beauty routine is a mess so nowadays there are a lot of products with charcoal in it. One of those products is the Luxcrime Charcoal Mint Mud Mask and I am really excited about this product because it is a local Indonesian brand. Local brand are getting really really good now and that makes me really happy because it's easier to get and price-wise won't break you wallet. I've been following Luxcrime Instagram's account for years now but never really got around it and the mask itself always solds out really fast. But.... One day I opened their Shopee account and it's actually available and On SALE!! It comes in a double box packaging. One for the gift box and one for the mask itself. I think the design is so pretty! There's the product information and their social media info on the side of the box and the ingredients, products benefits and how to use on the other side. The mask comes in a twist plastic jar and there's a plastic divider inside so the product won't leaked outside. But since the mask itself is quite thick I don't think it'll leak though. BTW since the jar is quite small I can take it for travelling and use the jar for small trinkets after it's empty. 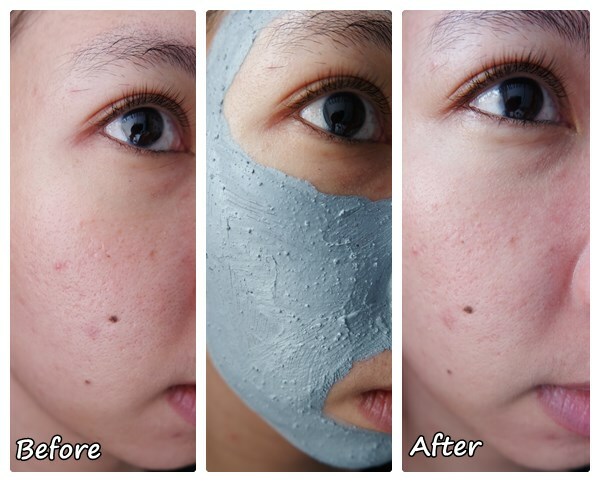 The mask is grey in color from the combination of Kaolin and Bentonite Clay, Rice Powder and off course Charcoal. There's bits of charcoal here and there and it's good for light exfoliate when I wash the mask off. There's a noticeable citrusy and minty scent when I took a whiff of the product but I don't really smell it when I use it on my face. I spread the mask on my face using a foundation brush since it's easier and I can spread the product evenly. I notice a slight tingling sensation like a minute after using it which feels a bit nice and also feels a bit pulsating kinda like when I use Aztec Secret Mud Mask but not as intense as that. I usually leave the mask on for about 20 minutes but sometimes less depending on my skin condition. When I feels that my skin is getting a bit tight before 20 minutes I rinse it off right away. After I rinse the mask off and use those gritty charcoal bits for light exfoliation I my skin feels really clean, soft and fresh. I especially like using this mask when I feels that my pores are really clogged and sometimes you just know that you're gonna breakout (TAT). It helps calming down my skin, reduce sebum and in the long run since the pores are clean those nasty blackheads and or whiteheads are less likely to appear too. As for reducing pore since my pores are originally quite big and there's nothing you can do with genetics. But... A clogged pores can make it appear larger and this baby helps to unclogged it and just keep it in its optimal size?? LOL... Overall if you have Acne Prone and Oily Combination Skin like mine I would totally recommends you to try this mask.